Golf carts have been a preferred method of transportation in some resort communities for decades. Now, some Ohio communities have opened the streets to golf carts. Golf cart laws, though, outline what is and what is not allowed on public roads in the state. Breaking the laws can lead to arrest and prosecution. Ohio law provides for the legal use of golf carts on some public roads. 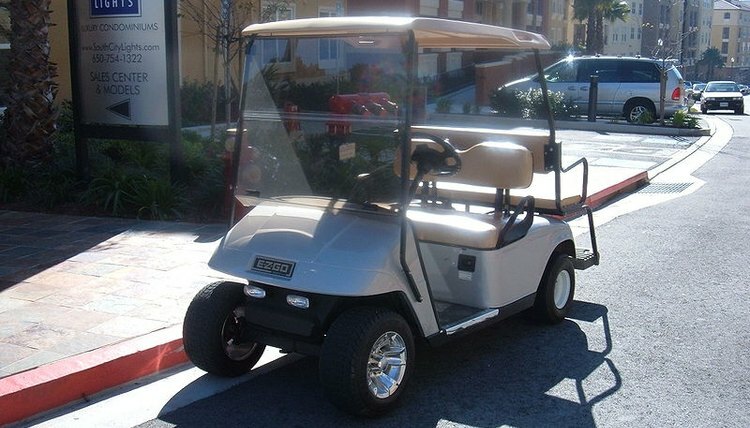 Street-legal golf carts must be able to meet the minimum speed requirements for roads. Therefore, they are not allowed on interstates or on major highways, where minimum speeds often are 45 mph or higher. Whether a cart is street legal is based upon a required inspection by a law enforcement officer, who provides the cart owner with an inspection report that must be submitted when the owner applies for a state-required vehicle registration and license. For a golf cart to be street-legal under Ohio law, the cart must include seat belts, a windshield, a rear-view mirror, a horn, turn signals and head lights and brake lights. Cart drivers also are required to follow the same rules as other drivers. For example, DUI laws and insurance laws apply to anyone driving a golf cart on public roads. Cart drivers must be licensed drivers. Ohio law also requires that a local community pass an ordinance regarding golf cart use before they can be driven on public roads in the community. The ordinances outline the specific usage that is allowed. For example, Canal Winchester, one Ohio village, allows golf carts after passing an August 2006 ordinance. Eight Ohio jurisdictions allow golf carts on public roads. They are Kelleys Island and Put-in-Bay on Lake Erie, Chippawa-on-the-Lake in Medina County, Yellow Springs in Greene County, Millersport and Canal Winchester in Fairfield County, Lakeview in Logan County and Wakeman in Huron County. In many communities, golf cart use has increased even before ordinances are passed. For example, Wakeman police recommended an ordinance allowing golf cart use on city streets after officers noticed that more people were operating carts. The ordinance was designed to monitor use and enforce proper driving of golf carts. The city's ordinance allows for vehicles to be driven on city streets where the speed limit is 25 mph. The carts are also allowed to cross other roads. According to a July 2008 article in "The Cleveland Plain Dealer," driving golf carts on public roads bring increased risk of injury for drivers. The article reported that cart drivers are at increased risk of concussion and are more likely to be hospitalized. According to the Nationwide Children's Hospital in Columbus, one-third of all injuries to golf cart drivers and passengers occur to children. Another study, conducted at the University of Alabama at Birmingham Center for Injury Sciences found that the highest rate of golf cart injuries occur to males 10 to 19 years of age and men over 80 years of age. The study recommended the use of seat belts and helmets for all drivers and passengers of carts operated on public roads. According to "The Columbus Dispatch" newspaper, there were 2,513 golf carts registered and licensed for street use in Ohio in June 2006. The majority were registered in resort communities in Lake Erie. Communities included Put-in-Bay, Kelleys Island and Lakeview. The article noted that a police officer in Put-in-Bay said under-aged cart drivers are issued a warning if they are found to be driving a cart. Then, if they continue to drive a cart, they are arrested and charged with driving without a license. Before an ordinance can take effect to allow golf carts on roads in Ohio communities, the police chief or county sheriff of the particular community must designate the area of jurisdiction and provide the information to the Ohio Bureau of Motor Vehicles, which is in charge or registering and licensing carts for those communities. The Ohio Bureau of Motor Vehicles also sends a letter authorizing the outlined use to the county's court clerk. White, Ron. "Ohio Law: Golf Carts on the Roadway." , https://legalbeagle.com/5439712-ohio-law-golf-carts-roadway.html. Accessed 18 April 2019.